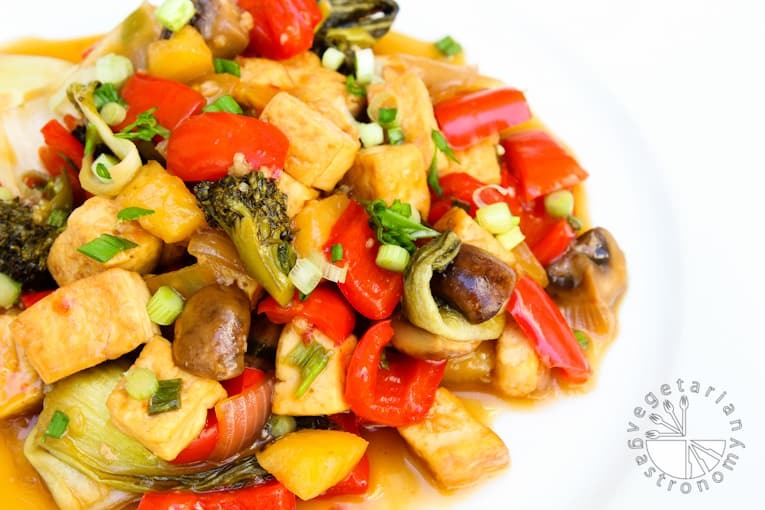 Sweet and sour tofu loaded with veggies and a delicious sauce — what could be more satisfying? This recipe is a guest post from my friend (and name twin!) Anjali at Vegetarian Gastronomy. I met Anjali a little over a year ago – she’s a blogger who I instantly connected with, she’s also vegetarian and offered to share this recipe with us today. It’s a healthified version of Chinese Takeout — with all of the flavor but none of the guilt. Welcome Anjali! I have been a follower of The Picky Eater for a while, and I am thrilled to be guest posting here! When I first had the pleasure of connecting with Anjali more than a year ago, I found out that we had a few things in common. Not only does she have an amazing food blog that continues to inspire me on many levels, but she coincidently has the same name and also graduated from UC Berkeley! She is a very sweet, down to earth person and has been a tremendous help ever since I first re-launched my own site. 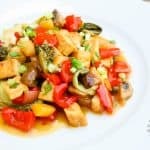 When Anjali asked me if I had any good Thai dishes, I was excited to share my version of Sweet & Sour Vegetable Tofu on her blog. Thai food is a staple at my house and is a family favorite. 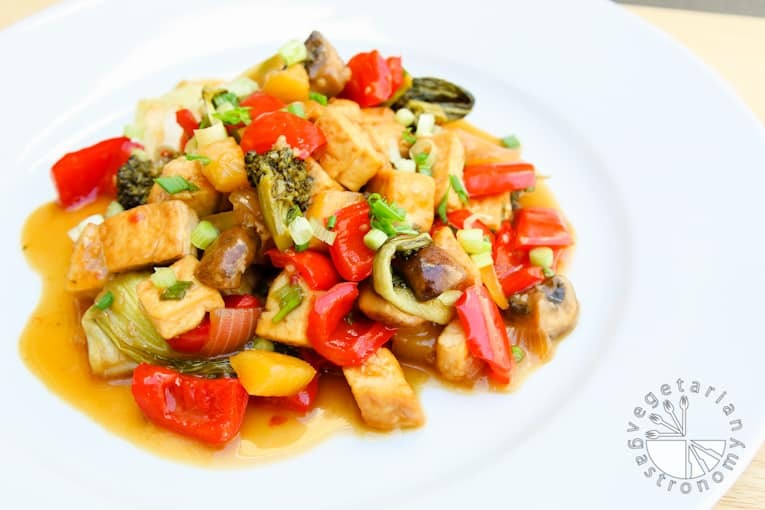 I love re-creating healthy, vegetarian versions of our favorite Thai dishes at home. 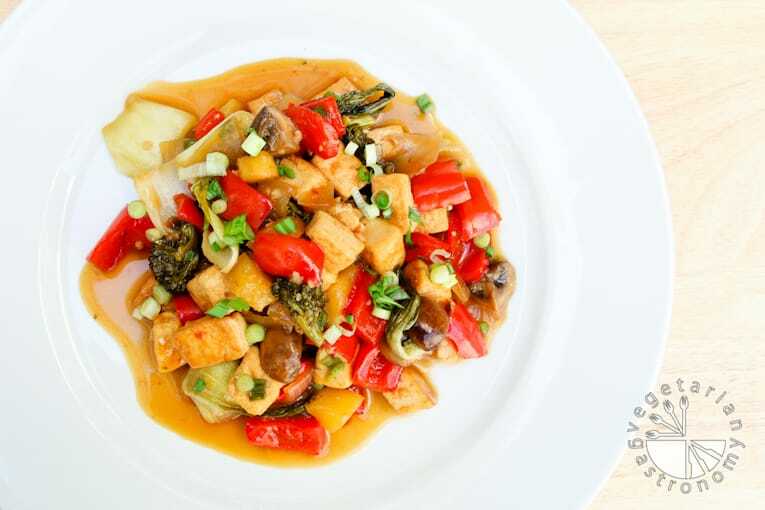 This colorful dish consists of tofu, pan-fried with a small amount of oil to give it that extra texture needed to absorb the sauce without the added fat of deep-frying. 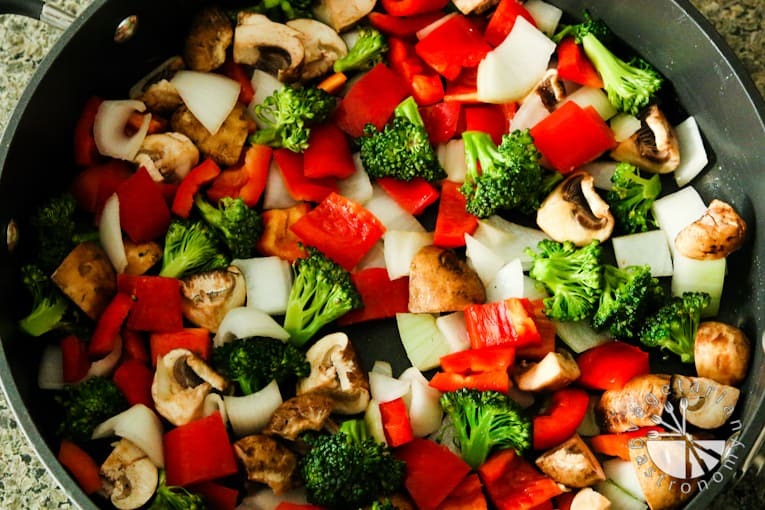 I also added some pineapple chunks and fresh vegetables such as broccoli, bell peppers, mushrooms, and onions. The juice from the pineapple chunks help balance the flavors of sweet and tart, and the actual pineapple pieces make for a perfect addition to the fresh veggies and tofu. The sauce is comprised mainly of every day ingredients and is extremely easy to make. My husband has always been a huge fan of Sweet & Sour Thai dishes at restaurants, and he absolutely loved the tangy-sweet flavor of this homemade version with a side of some brown rice. The dish left my entire family wanting more, even the kids. Step 1: To Prepare the Tofu. Cut the block of tofu in half. Place each half in 2 clean paper towels one at a time and gently press/squeeze to remove excess stored liquid (without breaking up the tofu). 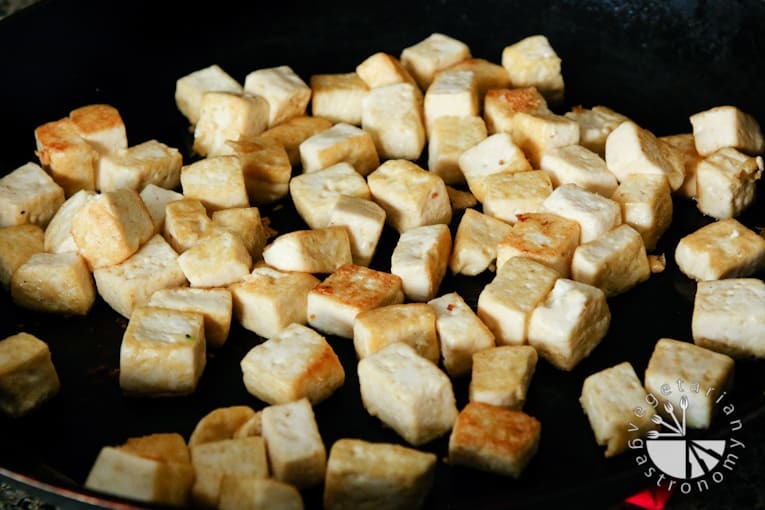 Cut the tofu into 1/2-inch cubes and pan fry on medium-high heat with 1 1/2 tbsp vegetable oil. Mix and turn frequently until all the water is burned off and the tofu is lightly golden brown on most sides (be sure not to burn the tofu). 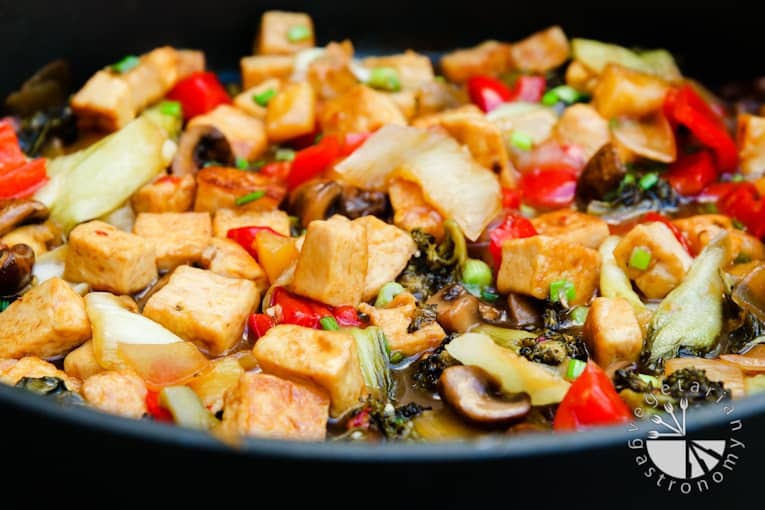 If you find that the tofu is sticking to the pan, add a little more vegetable oil. Set aside. Step 2: In a large non-stick skillet or wok, heat 1 1/2 tbsp of vegetable oil on medium heat. Add the fresh garlic and ginger and fry for about 10-15 seconds until fragrant. Step 3: Add the onions, mushrooms, bell pepper, and broccoli and toss to combine. 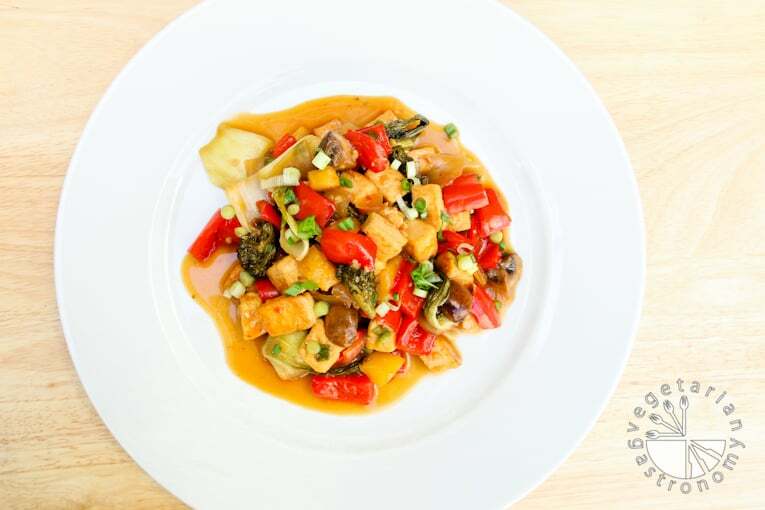 Mix frequently and sauté until all the vegetables are cooked and tender, yet still remain crispy. Note that all the water released from cooking the mushrooms should burn off while sautéing the vegetables. In the meantime, prepare the sauce. Step 4: To Prepare the Sauce. Whisk all the ingredients listed under sauce above until all the cornstarch has dissolved. Add more or less chili sauce depending on your preference of spice. Taste the sauce prior to adding it to the dish to make sure you have the right amount of sweetness and saltiness (especially if you are using tamari instead of soy sauce, or a different sweetener instead of honey). Step 5: Once the vegetables are tender and crispy, turn the heat down to medium-low. 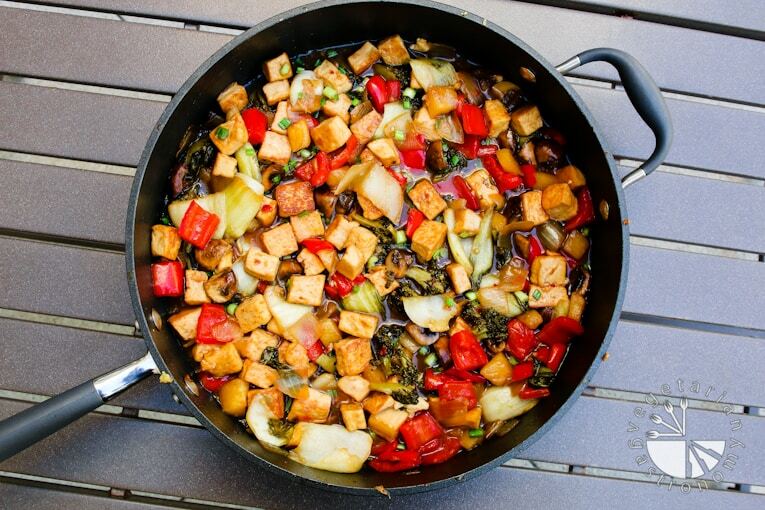 Add the pan-fried tofu to the vegetables. Slowly add the sauce and toss with the vegetables and tofu. After about a minute, add the pineapple chunks and chopped bok choy. Step 6: Mix slowly on medium-low heat until the sauce starts to thicken and coat the vegetables and tofu. Be sure not to burn off all the sauce (this should only take 5-10 minutes). Turn off the heat and add the chopped green onions. Toss once more and serve hot with a side of cooked brown rice. Add some international flair to your meals! Skip the take-out and try making a healthy version of fried rice or an easy, comforting Thai chickpea curry. Thanks for such a wonderful recipe Anjali! Everyone loved it!! I’ve been browsing through few of your recipes on and off, but this was the first one I tried and turned out amazing. We are vegetarians as well and am always looking for new things to try. Next on my list is to try your Lasagna recipe, hope I could get it at least close to yours :). So glad you liked this recipe! Can’t wait to hear how my Lasagna turns out for you – that is one of my husband’s absolute favorites! Happy cooking! This recipe looks awesome. you have really a great blog I loved it. Thank you so much Madhavi! Hope you get a chance to try out the recipe and enjoy it as much as we do! Your blog is so amazing! You totally give me inspiration! Thanks a million, I’m fixing to make this tonight!! 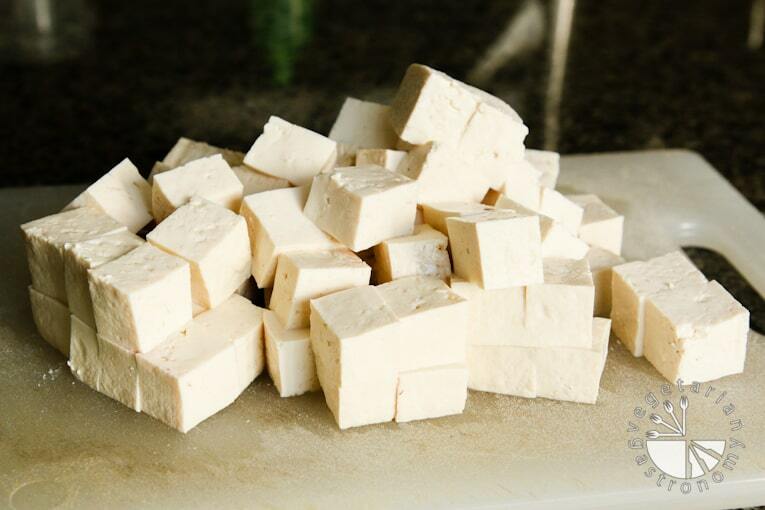 That looks absolutely delicious, such a great tofu recipe. Thanks for sharing! Thanks so much Frank! Hope you enjoy it! Love it! Thanks so much for the opportunity to guest post for your site! I hope you enjoy this dish as much as we do! And hope you are enjoying motherhood!